Born in French Algeria, Yves Saint Laurent likely saw a great variety of world dress while growing up. He moved to Paris at the young age of 17 to study fashion design. An obviously talented student, he was soon introduced to Christian Dior and worked with him in his atelier. Always a strong tendency towards international influence, this cotton maxi skirt uses a kicky multi-colored paisley print. The fullness of the skirt is box-pleated into the waistband, creating controlled and gentle fullness throughout. The waistband has a side zip and hook. 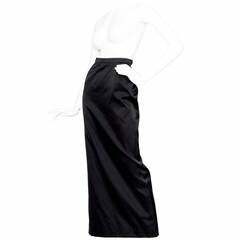 Often credited with making ready-to-wear reputable, this YSL Rive Gauche maxi skirt reflects the spirit of his expertise. As described in a 1976 New York Times piece, “The first bravos of the fall ready-to-wear shows ricocheted from the rafters at the Palais des Congrѐs this morning. The audience rose to its feet as…elegant peasants assembled on the runway and Yves Saint Laurent was hailed as the savior of fashion.” Size estimate: XS/S Measurements: Waist: 26 inches Hips: up to 37 inches Length: 40 inches This 1970s era maxi skirt by Yves Saint Laurent is in excellent condition. From his Rive Gauche collection, the peasant look is updated with box-pleating at the waist band, which closes with a side zip and hook. Made from a smooth and brightly printed cotton, this unlined skirt falls to ankle length. Professionally cleaned and pressed. High-quality vintage pieces like this are yours to live in and love while increasing in value every year. It’s never too soon to start collecting them, as an investment in your wardrobe—and in yourself.